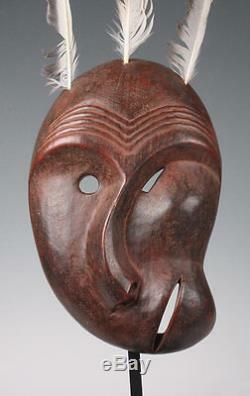 A finely carved and soulful contemporary Yupik mask presented on a custom stand, attributed to "Jones Huunt". It measures 19" overall in height to its common Seagull feathers by 8" wide. 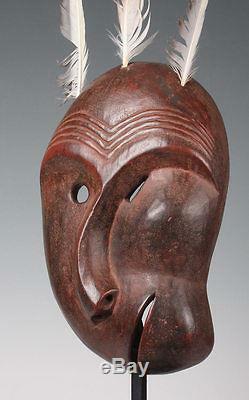 The mask itself is 11.75 (without feathers) and it has a semi-encrusted red painted surface very similar to that seen on like Iroquois false face mask. In good condition with a bold presence in person. 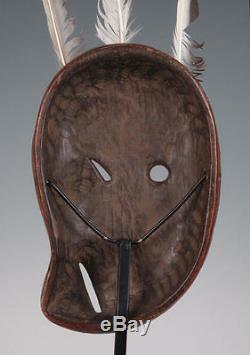 The item "YUPIK ESKIMO ARTISTS MASK, CARVED & PAINTED ALASKA FOLK ART" is in sale since Saturday, November 21, 2015. 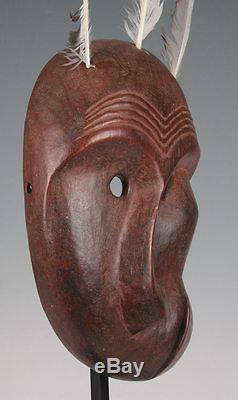 This item is in the category "Antiques\Ethnographic\Native American"." and is located in Ben Lomond, California. This item can be shipped worldwide.